Many investors fret about the small details when it comes to how to divvy up their equity asset allocations. But some wildly different allocations haven’t mattered much to returns over the long haul. You can see the impact of big differences in stock allocations by studying the returns of two variations of the couch potato portfolio. The original–or classic–couch potato advocated putting an equal amount of money into Canadian bonds, Canadian stocks, and U.S. stocks. On the other hand, the global variant puts equal amounts into Canadian bonds, Canadian stocks, U.S. stocks, and international stocks. If you focus only on the stock part of both portfolios, the first has 50% in U.S. stocks and 50% in Canadian stocks while the second has about 33.3% in Canadian stocks, 33.3% in U.S. stocks, and 33.3% devoted to international stocks. That’s a pretty big difference. Both options also deviate markedly from the global stock market. The MSCI World index provides a handy way to track the developed world’s stock markets. Think of it as being like the S&P 500 for the world’s stocks. These days it has about 60% of its assets in U.S. stocks, less than 4% in Canadian stocks, and roughly 36% in international stocks. 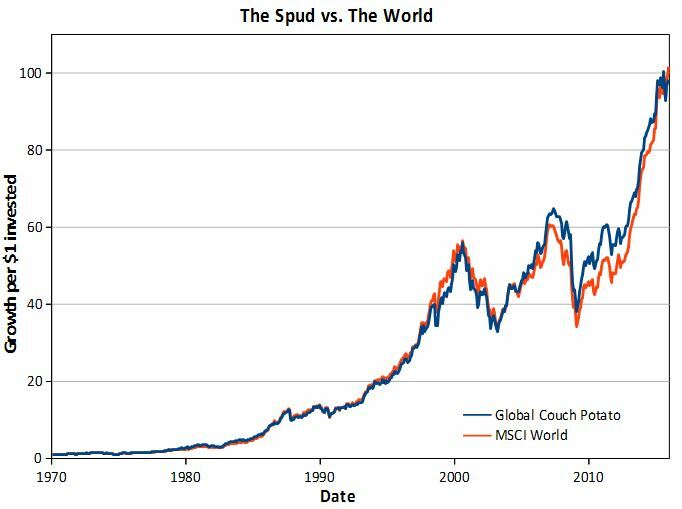 The graph below shows the long-term growth of the equity part of the global couch potato portfolio versus that of the world index. You can see that the two track each other fairly well over the long term despite the huge difference in equity allocations. The situation changes more noticeably if you look at the classic couch potato portfolio, which eliminates international stocks entirely. The graph below shows how it fares against the world index. But even in this extreme instance, the returns between the two haven’t been too far off. 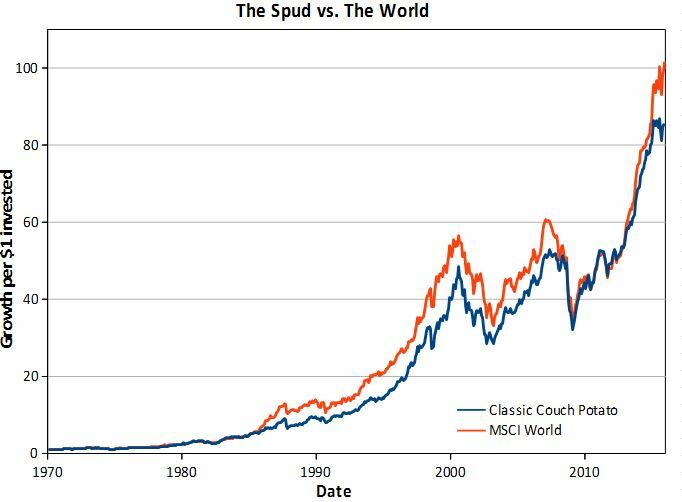 For instance, in the early part of this decade the classic couch potato was basically running neck and neck with the world index. I prefer the global variant of the global couch potato, which is more diversified than the classic version. But, based on past history, you probably shouldn’t worry too much if you have, say, an extra 5% devoted to Canadian stocks and proportionately less in U.S. and international stocks. Here’s the updated Safer Dogs of the TSX, representing the top yielders as of April 4. The list is a good starting point for those who want to put some money to work this week. Just keep in mind, the idea is to hold the stocks for at least a year after purchase – barring some calamity. This money manger reads almost 40 letters from CEOs a day. It seems like a simple cure for insomnia.